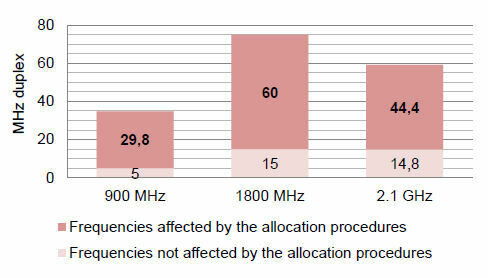 Arcep, the French telecoms regulator, has opened a public consultation on the reallocation of a bunch of frequency bands. Around 134 MHz of spectrum in the 900 MHz, 1800 MHz and 2.1 GHz bands is in play, which is currently being used for 2G and 3G by Orange, SFR and Bouygues. The 900 and 1800 were allocated in 2006 and 2009 under 15-year licenses, so are up for grabs again in 2021 and 2024. The 2.1 GHz was doshed out in 2001 and 2002 on a 20-year license. The table below shows all the licensed frequency in play. There are a bunch of considerations to bear in mind, but one of the big ones seems to be making frequency available to other players. This presumably means Free Mobile mainly, but maybe Arcep also wants to make it easier for other new entrants.